Saturday January 13th 1883 It turned cold again last night and this has been a very cold windy day. We were all the time doing the work and getting things ready for Sunday. Curtis Day and I were going down to Aunt Ems for supper but thought it too cold. I knit at night. 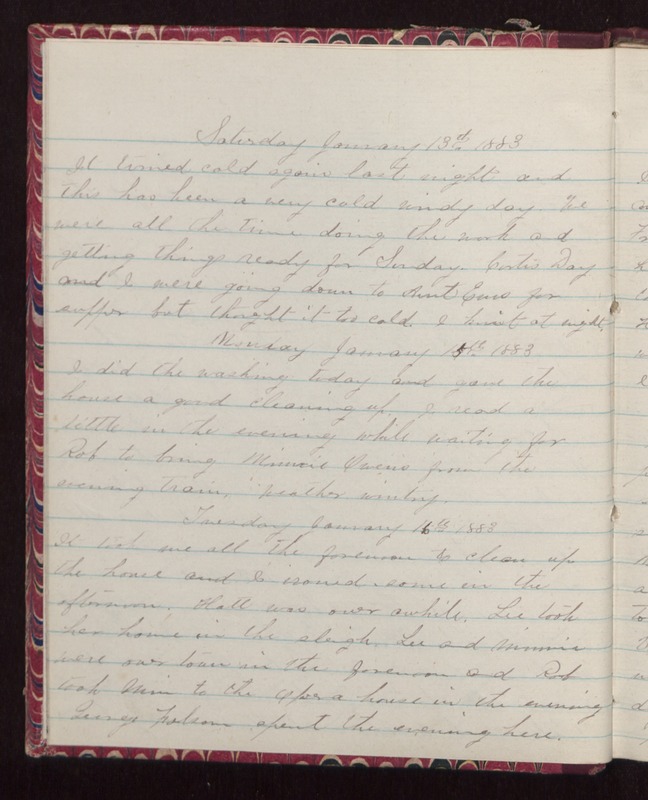 Monday January 15th 1883 I did the washing today and gave the house a good cleaning up. I read a little in the evening while waiting for Rob to bring Minnie Owens from the evening train. Weather wintry. Tuesday January 16th 1883 It took me all the forenoon to clean up the house and I ironed some in the afternoon. Hatt was over awhile. Lee took her home in the sleigh. Lee and Minnie were over town in the forenoon and Rob took Win to the Opera house in the evening George Folsom spent the evening here.